Since my early 20’s I haven't strayed too far from an ice rink having taught figure skating and hockey skating skills at a variety of rinks in the Cleveland area, including Euclid. When not with blades on my feet I can be found rolling around the world with the Inline Certification Program and the company Rollerblade promoting inline skating education. It is then only fitting that after all the years of skating (43 years), teaching skating (30 years) and living back in Euclid (15) that I am now back at C.E. Orr Arena once again as the director of the city's Learn to Skate program! More than 100 skaters, ages 3 years-75 years, participated in the program this season in tots, basic skills, adult and freestyle groups. In addition to these typical lessons offerings, we were excited to offer “hockey only” lessons this season in conjunction with the Lake Erie Panthers Hockey Club, which is a program of the Euclid Youth Hockey Association. With just helmets, gloves and sticks, the players were given the opportunity to focus only on the skating aspects of the game. While skating is universally understood to be the most important part of the game, there is usually not enough ice time to devote to mastering the basic hockey skating skills, making this a most welcomed opportunity for parents, players and coaches. 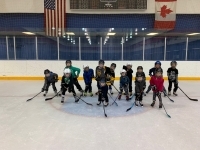 With the leadership of C.E Orr Ice Arena Manager/Program Administrator Hannah Zavorek and the assistance of a well-seasoned team of instructors including fellow Euclidian Barbra Tingley Parker, the 2018-2019 season was a success! In addition to Hannah, the LTS Instructors, and C.E. Orr Arena staff, I would like to thank Recreation Director Mac Stephens for giving me the opportunity to come back to my roots this past season. Our ice rink is one of the many jewels within our city and I am so honored to have the chance to grow skating participation and increase the use of this unique city asset. Thank you to all that participated in the Learn to Skate Program or who came out to public sessions this season. Thank you so much for supporting our program and the C.E. Orr Arena. It was wonderful to get to meet many of you and your children and I hope you will be back for lessons next next season. For those of you considering ice skating lessons for yourself or your family, our season will begin in early September 2019 and go through March of 2020. For the latest information please check out the City of Euclid website or like us on Facebook. Nearly a life long Euclid resident, Kris is a part-time lecturer at Cleveland State University in the Department of Health & Human Performance, a skating and yoga instructor and serves as the Learn to Skate Director at the C.E. Orr Arena and is Co-President of the Euclid Summer Swim Team Parent Board.